Crimson guard Christian Juzang '20 goes up for two of his career-high 21 points. Crimson beat Brown, 65-58. Earning a regular season sweep of Brown, Harvard men’s basketball tallied a 65-58 victory over the Bears on Friday at Lavietes Pavilion. With last night’s win, the Crimson remain in a tie for first place in the Ivy League standings. 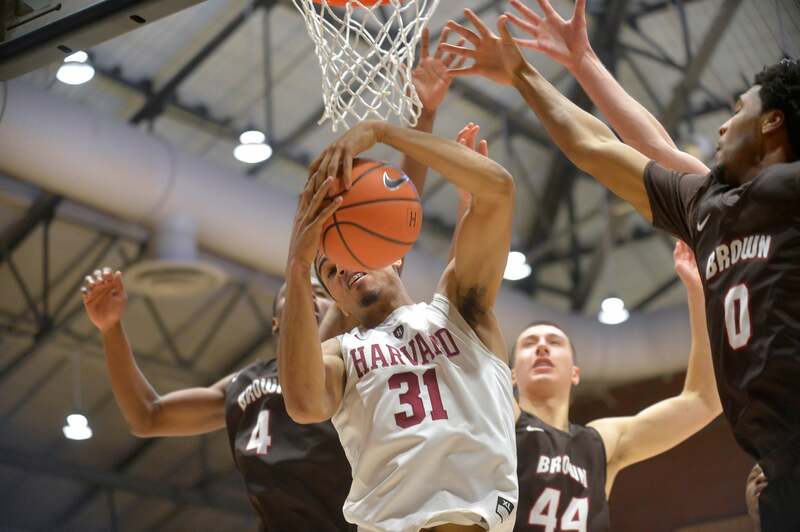 Harvard closes its home stretch with a visit from Yale tonight (Feb. 17) at 9:30. The game will be broadcast on ESPNU. In Friday’s game, sophomore Seth Towns led all scorers with 24 points, while classmate Christian Juzang netted a career-best 21 points. A third sophomore, Chris Lewis, scored eight points to go with 10 rebounds. Harvard (13-11, 8-1 Ivy) entered the break with a 27-25 over Brown (11-11, 4-5 Ivy), as Juzang scored 13 first-half points, including a trio of 3-pointers. The Crimson extended its advantage to eight, 23-15, after a triple from Towns, but the Bears fought back to make it a two-point game entering the intermission. A back-and-forth second half was tied with 4:19 to go at 51-51, but Harvard responded with five straight points to regain control after a hook from Lewis and a three from Towns. The Crimson connected on seven late free throws to secure the win, as the team outscored Brown 14-7 over the final four minutes. The win over Brown was Harvard’s fourth in a row, and the Crimson improves to 7-1 at home this season. For a full schedule and more information, visit the website. The Crimson women’s basketball win over Brown, 86-74, on Friday can be viewed online. Grammy Award-winning recording artist, songwriter, and visual artist Solange Knowles has been named the Harvard Foundation’s artist of the year.